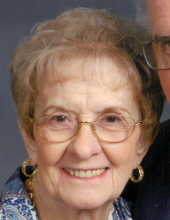 Betty passed away peacefully at home on November 26, 2018, surrounded by loving family members. Elizabeth “Betty” was born in Jackson, Michigan on January 14, 1932, to Mikolaj (Mike) Rakowski and Mary Orzechowski, both immigrants of Poland. When Betty was in her teens she came to California with her “adopted” family, Roscoe and Neil Sargent and their children. They settled in Sunnyvale, just down the street from where she met the love of her life, Louis Bo, who was working at the family store, Bo’s Market. They were married in August of 1951. Almost a year later their first son, Steven, was born, followed by David and Elizabeth (Betty). Betty was a stay at home mother during her children’s grade and high school days. It wasn’t until her daughter Betty left for college that she decided to get a job to get out of the house. Betty held various positions at GTC Technology, Hewlett Packard and finally the family deli, Friendly Franciscan. Sewing was an early hobby along with reading and shopping the malls. Later the QVC channel gave her much pleasure. Her husband Louis always joked that she and the UPS man were on a first name basis from her constant deliveries! She was also a member of the Sunnyvale, CA Grandmothers’ club. She is preceded in death by her husband, Louis Bo. Betty leaves behind her loving children Steven Bo, DDS (Beth) of Half Moon Bay, and Betty Smith (David, deceased in 2004) of Sunnyvale. Her son, David Bo (Michele) preceded her in death in 2004. She also leaves behind eight grandchildren: David Bo, DDS (Alison), Stephanie (Shane) Valiere, Alysha Bo, Andrea Bo, Marina Bo, Stephen (Stevie) Bo, Daniel Smith and Stephanie Fry, and one great grandson, Lucas Bo. She is also survived by her “adopted” brother Cloyd Sargent and his wife Pat, sister-in-law Rose Bo Marenco and her husband Carlo, and by many nieces and nephews. Betty is predeceased by three sisters, Regina Rakowski, Eleanor Rakowski Sussex, and Teresa Rakowski Hammer. Memorial services will be held Friday, December 7, 2018 at St. Martin’s Church, 593 Central Ave., Sunnyvale, at 10:00 a.m. The Bo family would like to thank Rowena for being a wonderful caregiver to our mom for the past year. Ro was definitely her angel. To plant a tree in memory of Elizabeth Barbara Bo, please visit our Tribute Store. "Email Address" would like to share the life celebration of Elizabeth Barbara Bo. Click on the "link" to go to share a favorite memory or leave a condolence message for the family.